(detail 1). 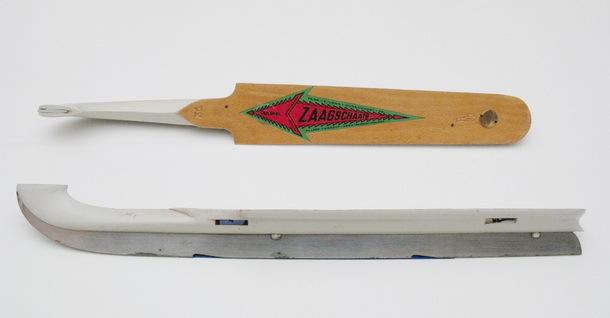 The Dutch word 'zaag' means 'saw' in English. The nicks were thought to act like saw teeth and thus providing for a better grip when 'clawing' in short track racing and in the turns of 400 meter rinks. This indeed turned out to be so but a bigger advantage came together. When braking by scraping the ice sideways the nicks bitted the ice too and quite often caused the rider to have a bad fall. Therefore the sale of the skates, that were introduced in 1954, was ceased in 1955 after just one season. As to make them distinguishably from common skates the bottom of the platforms were painted white. From paint rests on the blades it is assumed painting was done after the blades were assembled which is considered as a bit curious. 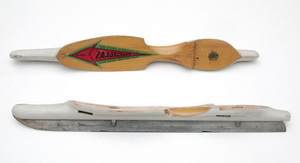 Saw skates have been made in three models: Friesland skates with short blades, Friesland skates with extended blades and Friesland speed skates. Here the speed skates are shown. The museum is still on hunting for a pair of the common model.